Nico Rosberg won Sunday's race to end Lewis Hamilton's run of four wins in a row. Lewis Hamilton’s rivalry with team mate Nico Rosberg is very different to Formula One’s famous 1980s feud between Alain Prost and Ayrton Senna, Mercedes motorsport head Toto Wolff said on Thursday. “It’s an intense relationship but this intensity is normal,” the Austrian said on the team website after a weekend of firefighting in Monaco. Rosberg won Sunday’s race to end Hamilton’s run of four wins in a row and seize the overall championship lead back from the Briton. However the cracks in the relationship were more evident than ever, with Hamilton suggesting the German had deliberately denied him a chance to take pole position by running off track in the final seconds of qualifying. Mercedes have started the season in dominant fashion, winning all the races with five successive one-two finishes from six starts, all from pole. “We have seen a lot of talk about their relationship but that’s not the key thing for a successful campaign,” said Wolff. “It’s a job, not a holiday, and the drivers need to work with and for the team first of all. “There have been a lot of comparisons to the Senna/Prost scenario, which is a kind of compliment to both Lewis and Nico. But the situation here is very different,” he added. Wolff said both knew the team would not tolerate any incident between them and reminded them they were representing nearly 300,000 Mercedes employees around the world. Hamilton played up to the Senna references at the weekend when he threatened after qualifying to take a leaf out of the late Brazilian’s book. The remark was interpreted by some as referring to Senna’s title-deciding collisions with McLaren team mate Prost but Sunday’s race passed without incident and Hamilton later told reporters he was joking. “I was seriously joking. 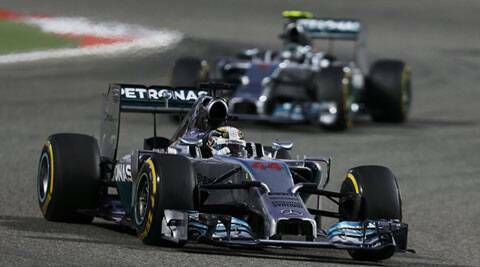 The priority is the team,” said the 2008 champion, now four points behind Rosberg.